Guest house, 2 Bedrooms, 1 Bath, (Sleeps 4) 1200 sq ft.
Nestled below the La Giganta Mountains, Loreto graces the Sea of Cortez. This is our paradise on earth. Our vacation rental is available for 3 night minimum, by the week or by the month. We offer you elegance with some of the best Diving, Fishing and Kayaking in the world. Our guest house overlooks the Sea of Cortez and is only 5 minutes from the Marina and 5 minutes from the heart of downtown Loreto. Our Guest house is quiet,private and has ice cold air conditioning.Designed in stunning Sante Fe architecture,our spacious 1200 square foot guest house by the beach sleeps 4 in a beautifully decorated living space using a 2 bedroom floorplan.It is perfect for 2 couples traveling together or a romantic and spacious getaway for two.Also, ideal for fishermen with boat parking available. Enjoy sunrises or morning coffee on your private covered terrace overlooking the Sea of Cortez and view of the La Giganta Mountains.No Smoking in the guest house but you may enjoy your Cohibas on the patio.For your dining pleasure the guest house has a fully equipped gourmet kitchen with your private outdoor BBQ. Fishing by reservation with the professional fishing Captain of your choice. Check out Scuba Dive shops in town or just hike the beach! We do not offer refunds ,however we honor future dates of your choice.This policy may change so ask us when you book so that we are in agreement. This property is a rare 3/4 acre compound on the beach. Very private, safe and just far enough out of town (half mile) that the stars look close enough to touch...So safe. Each Bedroom also has it's own sink etc. There is an indoor dining room and a dining table on the deck. This use is private. Only to be used by you and occasionally the owners. Barbara and Allen are wonderful hosts. They are there to help in any way, but respect the privacy of the guests. The house is spotless. The location is convenient. It's perfect. I highly recommend a rental car as there are so many neighboring villages and beaches to explore. Thankyou for taking the time to leave a review. The weather finally clicked on Spring here and I hope yours has too. Beautiful property at the beach in Loreto! We had a fantastic time while staying at this property in Loreto. The casita was wonderful, extremely clean, private and quiet. The pool is large and well looked after and great to swim in. Barbara and Al are wonderful hosts! When we first arrived, Al took us on a tour of the town which really helped us understand where everything was. Al also took us on an off road tour later in the week which was the thrill of a lifetime and well worth doing if you get the chance. We’ve been to several places in Mexico over the years and Loreto is certainly the most relaxing and friendliest place we have ever been. Don’t go expecting night life as that is limited but the restaurants were excellent and the service was great! The relaxing slow pace of life there was a welcome change from back home. We would highly recomend this property to anyone looking to spend time in an authentic Mexican town away from the noise and partying of places like Cabo. Thanks again to Barbara and Al, we loved the 2 weeks we spent at your Casita! It was beautiful and felt like home. This was our first time to Loreto and to this location. Barb and Al are the best and have a beautiful home. The best part of our vacation was having Barb and Al as our tour guides. They made it very easy for us with directions and tours. We did the tour to Coronado Island with Francisco, he picked us up on the beach. This is a must do!! We did not make the fishing trip this time, so that will be on our list for the next visit. The Casita was very cozy and had everything you could ask for. All you need to bring is food and clothes. The people of Loreto are so friendly and the local restaurants are amazing. When you arrive plan on a trip to the mission in the hills (San Javier) sorry if i misspelled it. Be sure to have Al be your tour guide and take the Razor Buggy on the long trip. Hold on and have a blast as he will take you the off road way to the mission. Be sure to stop for a snack and a beverage of choice before coming down. Its absolutely beautiful country. For pet lovers please feel free to give hugs to my buddy Freddy and Joey. Freddy was a rescue and gives the best hugs. We miss them. Thank you so much Barb and Al. you went above and beyond our expectations. Our stay at Barbara and Al's was most enjoyable. The grounds are lovely with landscaped plants, palms, sculptures, and the pool setting on the sea is relaxing and private with comfortable options to sit or lounge. The casita is very spacious with comfortable beds, a kitchen for easy food prep, original and interesting artwork, and cable tv from the US. There are views of both sunrises and sunsets. There is a lovely patio with table and chairs with a great ocean view where we enjoyed the sunrises and morning coffee. Our hosts were very accommodating and set up a boat tour of Coronado Island complete with a drop off at La Picazon for lunch, viewing a whale shark up close, then taking us back to our casita and dropping us off in front on the beach. Our hosts were available for any questions or advice, but we felt very private during our stay. The little town of Loreto had many very good restaurants, and fun shops. We loved walking on the beach one mile into town, or for miles the other direction. The weather was chilly during our stay, and that was the only thing we wish could have been better. Yes, we would like to return! The apartment is gorgeously decorated, well-equipped and in a beautiful location. Al and Barbara were fantastic hosts and provided us with information and suggestions on the best restaurants and activities in town. We enjoyed walking into town along the beach for breakfast, coffee and dinner on many occasions. The town is adorable and we enjoyed the restaurants, music and meeting some ex pats who live there permanently. Al took us on a UTV tour through the desert and up to the Mission. The half-day journey was a real treat that included the thrill of zipping through the desert trails, to getting a close-up view of the local towns and the Mission. Al also connected us with a neighbor who gives boat tours of Coronado Island. While on this tour, we saw dolphins and a large school of hundreds of Manta Rays. And, as many others have noted, our couple of meals at El Picazon were an absolute joy. The restaurant's location on the restaurant on the Sea of Cortez, to the personal service from Alejandro the owner, and the yummy and strong margaritas, make this restaurant a must for visitors. 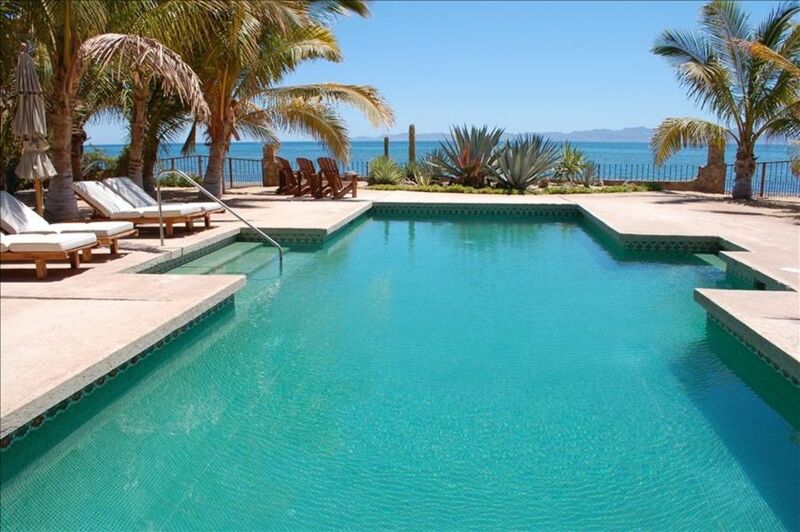 We highly recommend Al and Barbara's VRBO to anyone who wants to really experience Loreto! Great Casita and Great People! This property is top notch! Very modern, nice décor, and well maintained. The courtyard and pool area were immaculate as well. It is an easy walk on the beach to town. The Jordan's are very nice people. Easy to get along with and helpful with suggestions of where to eat, hiring fishing guides, shopping, etc. I woke up one morning and noticed I had a flat tire on my rental. Al took me to town and had a guy come to the house and fix it! If you have the opportunity to stay here, you will not regret it. It is really worth every cent. If you haven't been to Loreto, it is clean, safe, and the people are friendly. It is also very affordable. Thank you Al and Barbara for a great vacation! Wayne & Tianna. On Google map scroll from the Marina 1/2 mile North on the beach and we are the 2nd to last finished home on the beach. There are no refunds for cancellation. We will honor future dates and not at peak holiday times. The choice for online booking is available.